This Stainless Steel type 302 spring is used in a pollution control system in the automotive industry. Rather than calibrate each valve the customer requires a very tight tolerance for the spring. Starting with the best available raw material, Maverick coils the springs to a free length variation of less than +/- 0.004”, and a diameter variation of less than +/- 0.002”. End grinding is accomplished using CBN grinding wheels. CBN wheels wear very slowly and require no dressing, leading to infrequent and minimal adjustments to the grinding process. 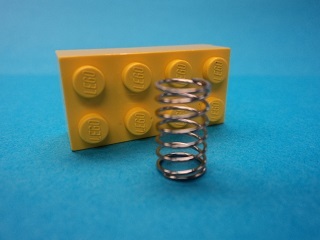 After grinding all springs are 100% sorted for spring rate and load at installed length. At all points in the process a strict Kanban system is maintained to keep tight control of quality. Not specified, but variation must be held to less than +/- 0.004"